The fusion of organic and choicest oils works great on your infant's tender and sensitive skin with protecting it from dryness and provides deep nourishment. The strong and proven antibacterial activity of the used herbal infused oils is a good solution to day to day skin problems,helps fight dry skin and any skin infections,and specially gets a natural glow and a sheeny complexion along with adequate skin care.The magical blend creates a loving and trusting bond with your baby while refreshing and comforting your baby,making it fun! The fusion of organic and choicest oils works great on your infant's tender and sensitive skin with protecting it from dryness and provides deep nourishment. The strong and proven antibacterial activity of the used herbal infused oils is a good solution to day to day skin problems,helps fight dry skin and any skin infections,and specially gets a natural glow and a sheeny complexion along with adequate skin care.The magical blend creates a loving and trusting bond with your baby while refreshing and comforting your baby,making it fun! 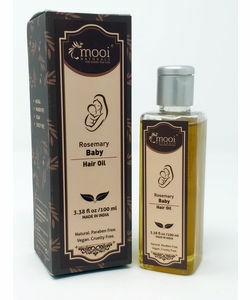 I have been using this oil for my newborn from day one it's just wonderful loved it.